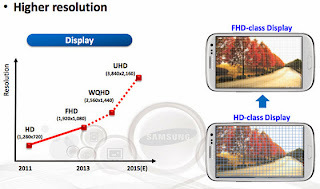 TECHNOLOGY: Samsung Phones in 2014 will have Double the Display with 16 MP Camera ! 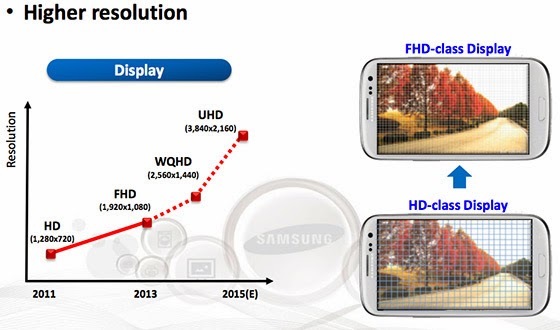 Samsung Phones in 2014 will have Double the Display with 16 MP Camera ! Samsung's Analyst Day gathering today shed some light on the company's future plans, and the display category was highlighted by the promise of 560ppi AMOLED panels for phones. Combine that with the 1440p resolution and you get a 5.2-inch handset — the same dimensions as on LG's 1080p G2, but with 78 percent more pixels. And if that's not enough, we're told to look forward to 4K resolutions — also known as Ultra HD or 3840 x 2160 — in 2015. Samsung also disclosed its plans for a new 16-megapixel smartphone camera sensor in 2014, while reiterating its plans to build new 64-bit ARM chips and noting that it intends to develop its own customized 64-bit core. That would give it parity with Apple, which is already custom-designing its own ARM processor for mobile devices.